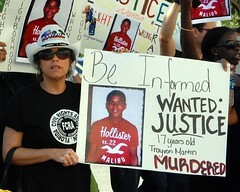 As the George Zimmerman trial gets underway, there have been cries throughout the country for “justice for Trayvon. What we all should be asking for is justice period. I’m hoping that the trial will answer some of the questions I have about what really happened that night. Zimmerman was obviously beaten. I’d like to know why. For me it hinges on one thing. Who approached whom? If Zimmerman was actively following Trayvon it could be reasonably assumed that Trayvon was the one who felt threaten and he beat Zimmerman in an act of self-defense. On the other hand, if Zimmerman was simply observing Trayvon, then he was acting in self-defence. What troubles me about this trial is that before most of us had heard anything about this case, the media was already spinning it as the racially motivated killing of a poor, defenseless black child by a paranoid neighborhood vigilante. The evidence that was shown early in the case was carefully edited to fit this narrative. Time has given us a clearer perspective. Zimmerman is not simmering with a deep-seated hatred of blacks. Yet, he is not a likable character. A cop wannabe, he lost a lot of credibility when he and his wife lied about their financial status. Trayvon, however, was not a squeaky clean choirboy. He had a been suspended from school and had a history of smoking dope. Equally troubling is how the race baiters (Jesse Jackson, Al Sharpton et. al.) wasted no time in using this tragedy for self promotion. Making sure the cameras were rolling, they posited their theory that Trayvon was killed because white people have an unreasonable fear of young black men who wear baggy pants and hoodies and listen to rap music. Nowhere in their call for a dialog on racial profiling was the admission that maybe, just maybe, young black men who fit that description are looked upon with suspicion because a disproportionate number of them are involved in violent crimes. Instead they stoked the dying embers of racial tension. So much so, that the fear of race riots has possibly caused the prosecution to resort to dirty tactics to ensure a conviction. This is in stark contrast to Travon’s parents. Good people who tried to do what was best for their troubled teen. They have turned their grief into action by setting up a charitable foundation. They continue to pray for peace, healing and justice. I do have to wonder though, what if the evidence shows that Trayvon was the aggressor? What happens if Zimmerman is found innocent. Is justice really what is wanted here? Or is it vengeance? Regardless of the verdict, justice for George Zimmerman is justice for Trayvon, too.